I brought this bunch home somewhere between a week and two weeks ago, when they were a bright, healthy banana-yellow. In that time I haven’t touched a single one. Not once was I even tempted to crack through their firm, supple peels. Because this…. This is far more delicious and holds worlds of promise. These mushy on the inside, leathery on the outside gems are full of sweet, concentrated banana flavor. You would be crazy to mash anything less black-on-the-outside into a baked good—be it muffins, cake, or the almighty banana bread. 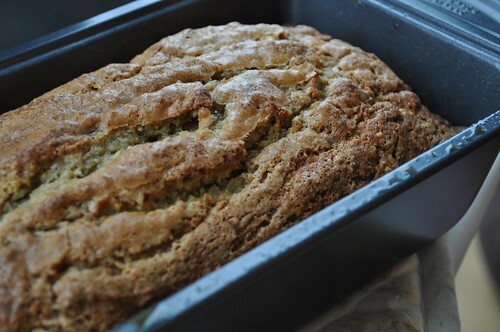 I love banana bread, but I have to be honest, I don’t love most banana bread. I’m always expecting something wonderful, but am often confronted with a dense, heavy slice of nut-riddled boredom or a bland, pasty, vaguely banana-flavored concoction that leaves my tongue feeling floured and sad. That’s just not how I do banana bread. Since I left my childhood home, the thing my mom most often says she misses is not the face of her firstborn child, not our deep mother-daughter conversation, not even having someone around to pick the crusties out of her cat’s eyes (yeah, I’m the only one that did it). Nope. It’s my banana bread. And before you pass any sort of judgment, you should know that I don’t fault her in the least. I agree. It was that good. So, naturally, I needed to create a gluten-free version. There was no way I could put my mother (who is also GF) through a lifetime of longing over something as small and silly as gluten. I think she’ll be pleased with this adaptation. I, as a matter of fact, like it even better this way. If I found out tomorrow I could safely eat gluten, I would still make this recipe. This bread is full of flavor and distinctly lighter than most versions. I am personally not a fan of adding chopped nuts as I feel it interrupts the overall experience, distracting one from the heavenly flavor of the bread itself. You nut-lovers out there will likely enjoy the presence of almond flour in this recipe. I use Bob’s Red Mill brand , which has a slightly coarse grind and leaves nutty little bits throughout. That said, though I cannot fully support it, fold in some nuts if you must. And since I’ve posted recipes for a few baked goods now, I’m sure you may have noticed a pattern. Yeah, that crackly, crusty, heavily-sugared top right there (and there and there)? It’s kind of an obsession of mine. If I’m baking it, and it’s not going to be frosted later, it will very likely have a sugar crust. You don’t always have to do this. I mean, I probably won’t be able to sleep if I advise you against it, but I just wanted to let you know that you do have a choice. 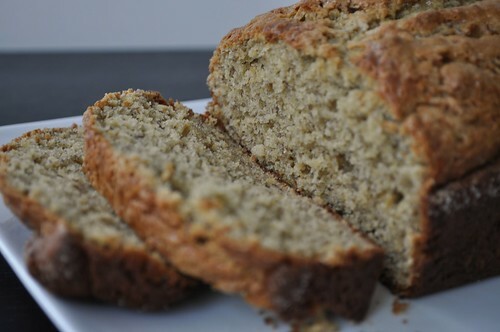 So choose to make this banana bread. It is by far my favorite and I’m betting it will become yours too. And just so you know, this recipe doubles really well—a very good thing considering I’ve never seen a loaf last longer than 24 hours. 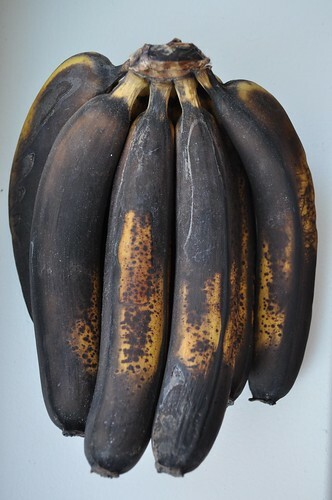 When letting your bananas ripen, really just let them go black. I know it may seem wrong, but this is key to a great-tasting bread. If they’re not moldy or oozing, they’re still good. In a large bowl, cream the coconut oil and sugar. Add eggs one at a time, beating well after each addition. 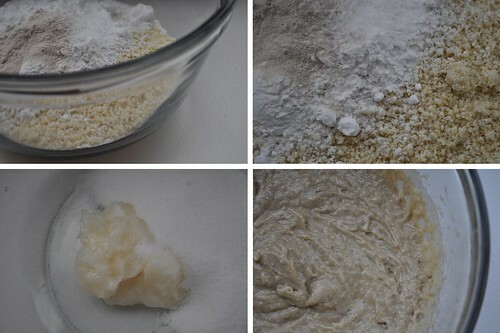 In a medium bowl, whisk together the sorghum flour, almond flour, potato starch, xanthan gum, baking soda, baking powder and salt. Mix one third of the dry ingredients into the creamed mixture. Next, add 1/3 of the mashed banana. 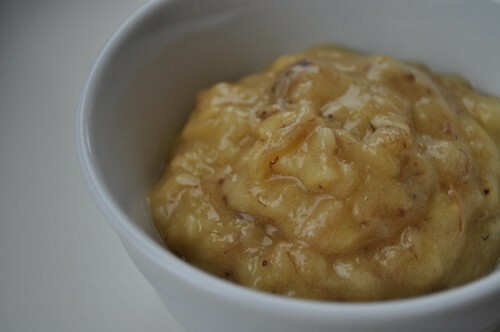 Continue adding the dry ingredients alternately with the banana until all ingredients are combined. 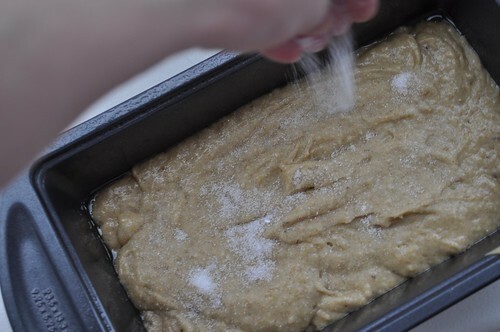 Pour batter into a well-greased 9x5x3” loaf pan and sprinkle generously with sugar if desired. Bake for 45 to 50 minutes, until puffed and crusty and a toothpick inserted in the center comes out clean.